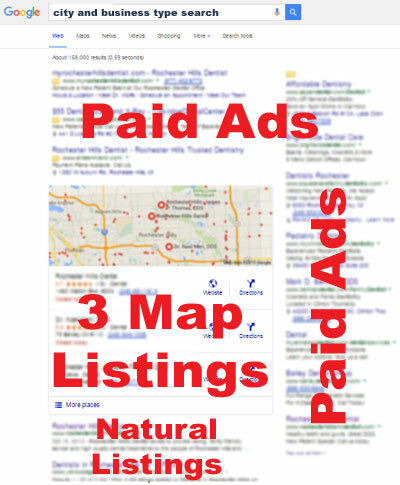 If you have a business that serves local customers, it's critical that you get into Google's map listings. When someone types a city name and business type, Google often features three businesses and highlights them (with larger circles) on a map on their default search result. These three businesses have a HUGE advantage over their competition when it comes to getting website visits and phone calls, yet many businesses make no effort to claim their listing and get it to show as one of the primary three. Don't make this mistake! To get your business to show up, it's important to claim your listing and verify your business, then enhance that listing in specific ways. And finally, you'll want to provide outstanding service so that customers give you positive reviews. That's the entire process of getting seen! You can claim your listing for FREE following the instructions below. You can then look online for guidance on enhancing your listing, or let me assist. I recommend letting me help, as it probably doesn't make financial sense for you to learn all the techniques you can use. If you can provide me with images of your business that I'll request, I can perfect your listing for just $199. I'll also help you understand the process of getting reviews for your listing, which is critical to helping drive its visibility. Please note that I will only assist up to THREE businesses in each industry in each city so that my clients have the best opportunity for this premium level of local visibility. 1) Log into a Google account for managing the listing. I recommend that you have one for your business, as the business can also use it for Google services like Analytics and Adwords. But anyone with permission can claim the listing while logged into Google. 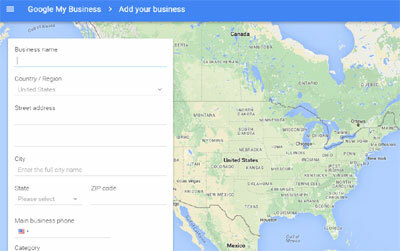 3) Search for your business by name and, if needed, by city. If you find a match, click next to that match. (If not, see #5 below.) You will be asked if you're authorized to claim the listing. Assuming your are, check the box and move on. 4) You will then be asked to verify your business. They will either need to send you a postcard or, in some cases, they may be able to give you a phone call. Choose an option. You will get a verification code that you need to use to verify your listing. 5) If your business did NOT show up when you searched for it, you'll need to click on "Add your business" and then fill out a form like the one shown in the image here. After you provide this information, you'll be asked to verify the business. 6) When you get your verification code by phone or mail, you'll need to enter it by following the prompts on your new business listing within Google. 7) After this, you will want to enhance your listing with information and images. There are ideal ways to do this that take some learning, so if you don't want to figure all of that out, I can get your listing ideally set up for $199. Please note that this service is not done in association with Google, but simply assists in enhancing a Google business listing.